For weeks, leaders in Congress have emphatically warned they must avoid the deep, across-the-board spending cuts hitting the federal budget March 1. But with just two weeks left to avert the so-called sequester, members of Congress are leaving town for a week-long recess. As they leave town, Democrats and Republicans are both predictably placing the blame on each other for the looming budget cuts, which amount to $1.2 trillion over 10 years. Both parties have, in fact, put forward their own ideas for averting the sequester, but the efforts so far have remained strictly partisan. Paul Ryan on sequester: "I think it's going to happen"
If no deal is reached by March 1, the Pentagon would have to start implementing a plan to cut its budget by about $500 billion over 10 years. Another $500 billion would hit non-defense programs. 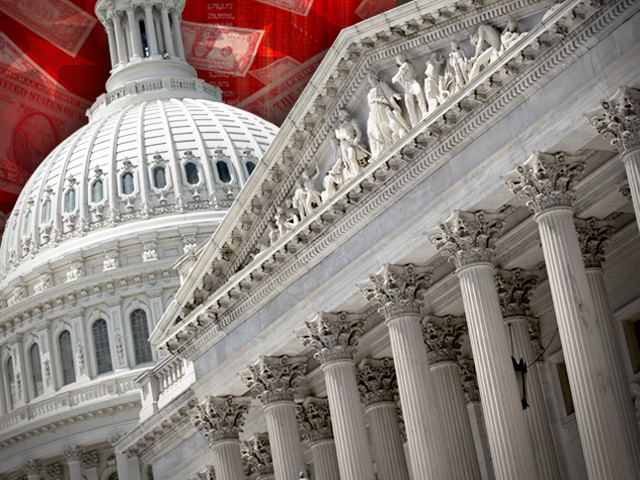 Economists agree the steep, across-the-board cuts would slow the economy. The White House recently laid out the ways the sequester would hurt the middle class, from slashing education programs to small business loan guarantees. Taking $1.2 trillion out of the economy would put close to a million jobs at risk, the nonpartisan Congressional Budget Office has estimated. At this rate, however, it may take some economic damage to get Congress to work together. "The sequester will be in effect until there are cuts and reforms that put us on a path to balance the budget over the next 10 years," House Speaker John Boehner said yesterday. "Period." Democrats in both the House and Senate yesterday unveiled legislation that would replace the 10-year sequester for the rest of 2013 -- 10 months -- with $60 billion in spending cuts and $60 billion in new tax revenue. Most of the tax revenue would come from enacting the "Buffett rule," requiring those with incomes over $2 million to pay a tax rate of at least 30 percent. White House spokesman Jay Carney released a statement calling it a "balanced plan." "Now, Republicans in Congress face a simple choice," he said. "Do they protect investments in education, health care and national defense or do they continue to prioritize and protect tax loopholes that benefit the very few at the expense of middle and working class Americans?" Republicans, however, insist they aren't going to vote for any plans that raise new tax revenue. Senate Minority Leader Mitch McConnell, R-Ky., yesterday dismissed the Democratic plan as a "gimmicky tax hike designed to fail." House Republicans, meanwhile, note that they passed legislation last year to address the sequester. But since the Democratic-led Senate never picked them up, they'll now follow the Senate's lead. "It's time for the Senate to do their work," Boehner said. "If they're willing to pass a bill, we'll find some way to work with them to address this problem... The sequester -- I don't like it. No one should like it. But the sequester is there because the president insisted that it be there." House Democrats suggested that if GOP leadership would put their plan up for a vote in the House, it would actually garner some Republican support and pass. "The only thing that's standing in the way of having 750,000 jobs lost is having a vote," Rep. Chris Van Hollen, D-Md., the top Democrat on the House Budget Committee, said yesterday. House Minority Leader Nancy Pelosi, D-Calif., slammed for GOP leadership for putting the House in recess for a week before voting on the plan. "We don't think there's any time to waste," she said yesterday. "Every minute counts, and it's really hard to explain to the American people [that] tomorrow we'll be leaving for more than a week when a deadline is looming. Sequester is out of the question." McConnell, meanwhile, said that if Democrats were serious about averting the problem, their leaders in the Senate would have drafted legislation and carried it through the standard committee process last year. "Instead they waited right up to the moment of crisis.. and then got together, not with the goal of finding a solution," he said, but to "make Republicans look like the bad guys." "There won't be any easy off-ramps on this one," he added. "The days of eleventh-hour negotiations are over." The Democratic legislation put forward yesterday would raise $55 billion from the "Buffett rule," by requiring wealthy taxpayers to pay a 30 percent tax on all of their adjusted gross income, phased in between $1 million and $2 million. The proposal would also eliminate a tax break that encourages companies to ship job overseas and eliminate a tax loophole for the oil industry. The Democratic plan would include $27.5 billion in defense cuts through 2012, as well as $27.5 billion in domestic cuts over 10 years. Van Hollen said today that Democrats were open to tax reforms more palatable to Republicans -- later on in the year as part of separate tax reform efforts. "There are lots of tax breaks that shouldn't stay in the tax code for another second," he said. The $1.2 trillion sequester cuts, which were initially set to kick in on Jan. 1, emerged out of Congress' 2011 budget negotiations. Congress agreed that if a congressional "supercommittee" couldn't come up with an acceptable deficit reduction plan, Congress would just slash $1.2 trillion from the budget over 10 years -- half coming from defense spending and half from non-defense. Given the economic damage the sequester would inflict, Congress this year stalled the cuts for two months -- which is why they're now set to go into effect in March.